In the interest of full transparency, I almost forgot to write this blog. In my defense, I kept forgetting it was Thursday (when I usually write). I was also watching Japanese wrestling (which is good since I was having withdrawals after their month-long tournament ended in August) and I was super excited because the new Sam Smith song was released at midnight. I was slightly stressed out because the single wasn’t coming up on iTunes or on his website. It was finally available about 10 minutes later. After listening to it a few times, it dawned on me that I didn’t write my latest blog. Luckily, I’ve always been good at writing well on a deadline and already had a topic picked out. So let’s get to it, shall we? My excitement for new Sam Smith music made me forget I needed to write my blog. Oops. I hope you had a good Labor Day (the US just had this holiday on Monday; hence why I forgot it was already Thursday). 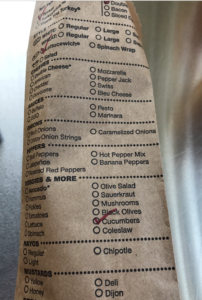 A friend of ours had told us about Which Wich? having options for Nikki. We’d been meaning to go, so when our dad offered to take us to lunch on Labor Day, it was one of the places I suggested (our dad was the one that ultimately decided). 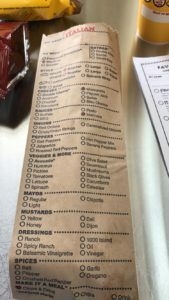 If you’re not familiar with Which Wich?, they are a fast casual restaurant serving a variety of sandwiches that come with standard versions that can be customized. They opened their first location in Dallas, TX in 2003. They have locations across the US and in 2013, branched out to Dubai, Mexico, & Panama. Restaurants expanded to Bahrain, Kuwait, & Qatar in 2015. Which Wich will continue its expansion by having locations in Egypt, Lebanon, & the U.K. In addition to their regular menu, they also have a gluten-free menu. *Hooray* Sandwiches can be made as a Lettucewich or Bowlwich. Some of the options: Turkey, Ham, Chicken Pesto, Tuna Salad, The Avocado, and Pepperoni Pizzawich. There’s also a separate Vegan & Vegetarian menu. If you need to get very specific, then you need the Nutritional Info menu. This breaks down the entire menu vertically with allergens horizontally. It’s clear which menu items contains (or doesn’t contain) allergens. When you’re ready to order, choose a brown paper bag that corresponds with the menu item (broken into several categories; e.g.-Italian). 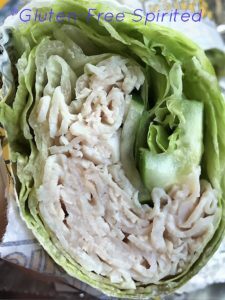 Nikki chose the Turkeywich with cucumbers on a Lettucewich. Since she was limited on additions to her sandwich, she asked for double meat. 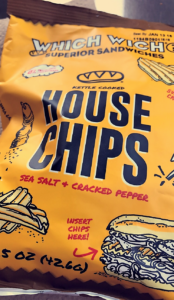 For her side, she chose the House Chips. Even with the limited ingredients, she still enjoyed her meal. She’s also pretty happy to have a new place to eat while traveling. Customize your Wich with their easy ordering system. Which Wich? also has the meats. Nikki was pretty happy with the bag illustration of chips on your Wich; she was promptly disappointed when chips wouldn’t fit in hers. You have now reached the #foodporn section that has food containing things that Nikki cannot eat. I opted for the Meatballwich on regular bread with mozzarella & marinara sauce. It was pretty good! In case you were wondering, I had nacho Doritos with mine (and forgot to take a picture). Just a few ingredients needs for a delicious Meatballwich. If you liked this blog, you might be interested in what to order at Chili’s, Smashburger, Texas Roadhouse, & Cracker Barrel. Don’t forget to sign up so that you won’t miss any new posts. Be sure to follow GFS on social media and sharing is caring! 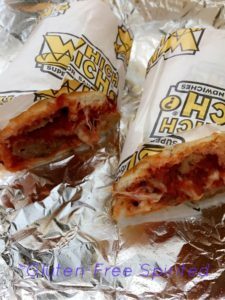 I love Which Wich – When I lived in Texas I used to eat there often. There is just one in the DC area. It’ll definitely be a place we go to often and it’s so helpful that they have many locations throughout the US and in other countries. As always, I’m in awe at your dedication to find alternative options for non-meat eaters. And honestly, I go to these restaurants all the time and had no idea they had these. Good to know! Thanks for the info. It’s so hard finding gluten free lunch options. This place looks like a gem. You’re welcome, Yana. This place is really good & it’s great to see how much they’ve expanded into other places. Great options! We were just traveling and I totally struggled to find foods on the menu that stick with my ketosis diet, so I veered a bit off course. But I try to do as much research in advance so I know where to go! I can imagine that must be very time consuming! This is fantastic and that wraped looked so good. I like the concept behind this it really is an ideal thing to do so help with dietary restrictions. I agree! My sister really loved the Lettucewich. I actually just went to Which Which a few months ago and I didnt even realize how extensive the menu was! It was amazing all of the options I need to eat their more often! My friends always rave about this place all the time. They often talk about the sandwiches and the ordering process too. I could barely control myself when I finally visited the place. I wish that I had tried them sooner! The ordering process is so easy & efficient. I think it’ll be a place we eat at often. This is such a great and helpful post, I love seeing how many places are really starting to come forward and listen to customers who can’t pick just anything from the menu. That meatballwich looks delicious!! I’m glad you found this post helpful! It really is great that more & more places are becoming more accommodating. The meatballwich is very good! I have a few friends that can’t have gluten- which is super unfortunate. So I will share this with them. This is so great! I love the concept behind this and it gives vegans and persons with dietary restrictions to have plenty of options. Oh my those sandwiches looks so good! Such a shame I don’t have a Which Wich around! Thanks for the heads up! Love the fact that there are gluten free options! This all looks AMAZING! 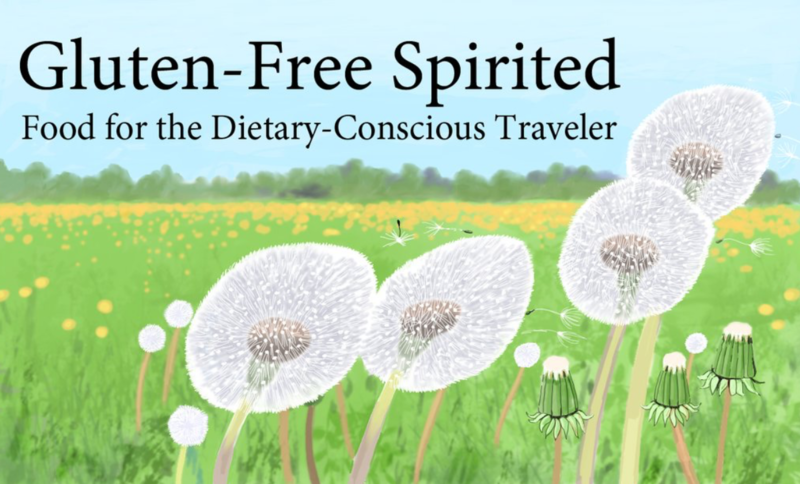 I have been thinking about going gluten-free – but sometimes, I never know what my options are! Or if there are many! Thank you for this! It can be difficult at times and it seems many places don’t promote that they have these type of options, so either the customer has to ask or Google beforehand. I hope to help combat some of that by posting about places here and/or my social media platforms. Good to know! Meatballs look so yummy! Love these choices – thanks so much for sharing! 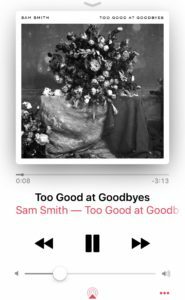 Also, loveee Sam Smith’s new song! You’re welcome! 🙂 It’s SO good! I can’t wait for the new album!! I haven`t heard about this place before but it seems like a nice one. I love the name WHich Which. It is very creative. I thought it was very creative too. Definitely stands out! Their website says locations are coming to the UK next year, I believe. these pictures are making me super hungry – love which wich! We weren’t either until we were forced to become more aware of it. We were pretty oblivious! Woah!! Thanks for this, It’s really hard finding gluten free lunch options. I will definitely put this on my book mark for my future references to my next visit there.